In Israel, elderly poverty rates based on market income (before transfer payments and taxes) are the lowest in the West, thanks to more widespread private pension ownership than is common in other developed countries. However, Israel provides fewer benefits for the elderly and limited income support. Consequently, disposable income poverty rates (after transfer payments and taxes) among Israel’s elderly are the highest in the developed world. Many of the elderly – particularly females, Arab Israelis, and those who immigrated to Israel from the former Soviet Union at an older age – have little private pension savings, if any, making public assistance even more essential for them. The new Taub Center Policy Brief comes on the heels of recent research at the Center which found that among developed countries Israel’s elderly poverty rates in market incomes are the lowest, while poverty rates in disposable income are the highest. 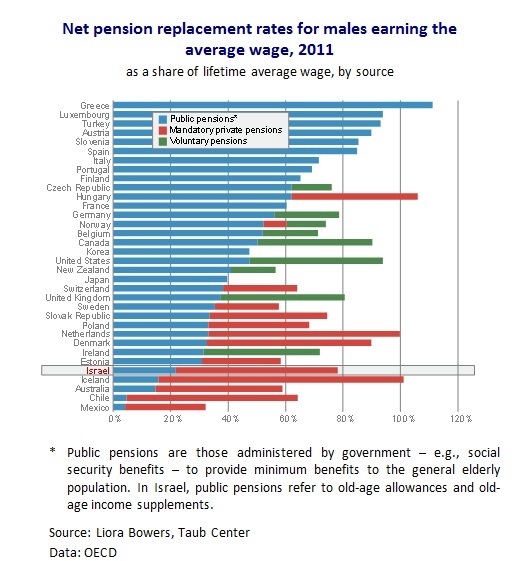 Liora Bowers, Director of Policy at the Taub Center, examined the reasons for this anomaly, finding that it is related to Israel’s policy regarding private pensions, which historically were more common in Israel than elsewhere and have been mandatory for workers since 2008. Alongside this, the state provides the elderly with relatively limited financial assistance. For example, an Israeli male entering the labor force in 2011 and earning the average wage will receive 56 percent of his average lifetime wage from his private pension upon his retirement – a relatively high rate compared to the other countries examined. At the same time, the same Israeli will receive only 22 percent of his average lifetime wage from old-age allowances, versus the 50 percent average rate across the OECD. In addition, Bowers has found that only 24 percent of the elderly in Israel receive public assistance in the form of income support. Owning a vehicle (certain types), land or savings make one ineligible. “These criteria are considered very stringent by Western standards and may disproportionately hurt elderly Arab Israelis, who are more likely to live in agricultural villages and have greater dependency on both car and land ownership,” explains Bowers. The Taub Center Policy Brief also highlights that today’s mandatory pension contributions rate of 17.5 percent (considered relatively high in the West) reduces the take-home pay of low-income earners, creating an economic burden for young, poor families. For example, there are low-income workers who, upon retirement, may receive private pensions and public allowances totaling up to 140 percent of their average earnings. In some cases, these workers might have been better off if they had lower pension contributions and greater take-home earnings at younger ages – for housing and education – in exchange for lower income upon retirement. Furthermore, if mandatory high pension contributions are accompanied by a future reduction in government spending on income support, many low-income earners today may be worse-off than under a voluntary pension contributions system. Bowers concludes: “Israel’s polices place great responsibility for one’s economic future on the individual and his savings, and is geared towards minimal public assistance. This makes it challenging for low-income families to support themselves in the present.” The Taub Center for Social Policy Studies in Israel, headed by Professor Dan Ben-David, is an independent, non-partisan institution for socioeconomic research based in Jerusalem. The Center provides decision makers, as well as the public in general, with a big picture perspective on economic and social areas. The Center’s interdisciplinary Policy Programs – comprising leading academic and policy making experts – as well as the Center’s professional staff conduct research and provide policy recommendations in the key socioeconomic issues confronting the State. For details, or to arrange an interview, please contact Gal Ben Dor, Director of Marketing and Communication 054-464-2333.